King of Jazz (1930) was an ambitious project. The darling of Carl Laemmle's heir Carl Laemmle Jr., it sought out to showcase jazz superstar Paul Whiteman. The bandleader's popularity was staggering, boosted by his penchant for publicity and his ability to add to combine jazz with symphonic style. His name carried so much clout that night clubs were eager to be connected with him. Even his sideline bands and his singing trio the Rhythym Boys, made up of Al Rinker, Bing Crosby and Harry Barris, were in high demand. 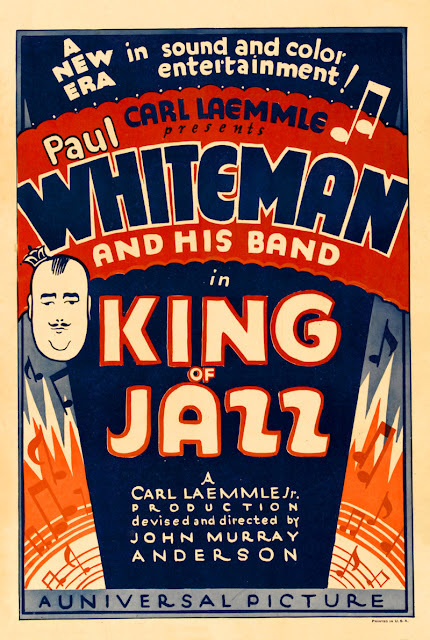 In 1927, Whiteman was at peak popularity and with the advent of sound in the film industry the Laemmles pounced on booking Whiteman for King of Jazz. But what exactly would this movie be about? At first Universal tried to give King of Jazz a plot but what stood in their way was Whiteman himself. He wasn't particularly good looking so a romantic lead would be out of the question. He also wasn't much of an actor. Universal tried several times to make a musical out of King of Jazz. One of my favorite directors, Paul Fejos gave it a shot. As did other directors and other writers. Nothing was quite right. It didn't help that Whiteman turned everything down. It wasn't until musical theater director John Murray Anderson came on board and King of Jazz became a musical revue instead of a musical movie with a plot that the film started to take form. It featured a bevvy of talents, including Paul Whiteman himself, some from Universal's stock including John Boles, and others from theater and vaudeville. After many delays, King of Jazz released in 1930. Unfortunately, the onslaught of musicals and musical revues in the early talkie era created a fatigue for this genre of film. There were major flaws with the final production and critics and audiences alike took notice. As a result, it didn't perform well at the box office. However, this two-strip Technicolor movie was innovative and served as a time capsule of the era's entertainment industry. It would prove to be a historically important film. In Layton and Pierce's follow up to The Dawn of Technicolor, this book explores all that went into the making of King of Jazz and beyond. 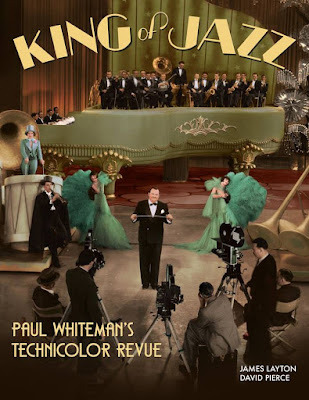 Readers are treated to a history of Universal Studios, a full background on Paul Whiteman and a soup to nuts look at everything that went into the production of King of Jazz down to the smallest detail. For example, we learn all that took to make the Rhapsody in Blue number as blue as possible which was nearly impossible with two-strip Technicolor. Only red and green would show. In order to mimic blue, they juxtaposed a light green with silver. Also, did you know that Bing Crosby was going to have a bigger role in King of Jazz? He caused a car wreck and upset a judge which landed him in jail. He would be released from jail each day to work a bit on the movie only to go back after he was done. We also learn about the film's release, subsequent re-releases and the nine foreign language versions. The film's legacy is a complicated one. King of Jazz was chopped up and prints and scenes went missing. It took decades to put it back together and it's still not fully complete. The authors also delve into the expensive and impressive recent restoration effort conducted by NBC Universal. I had the pleasure of seeing the restored film at last year's Capitolfest. (The video above is not from the restoration rather from the color corrected re-release. 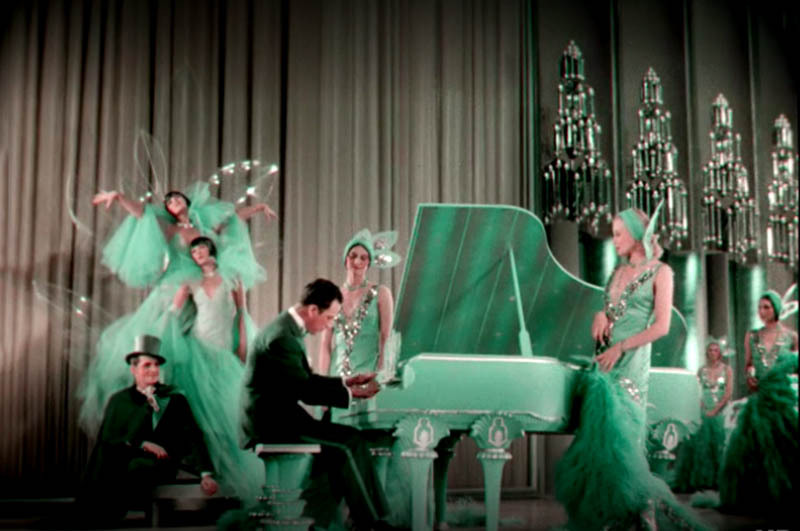 King of Jazz: Paul Whiteman's Technicolor Revue is a monumental feat. It's mind-boggling how much research went into this book. As I read through it I kept thinking to myself, what great lengths it took the authors to dig up all this information and present in such a composed and orderly fashion. I contributed to the Kickstarter campaign for the creation of this book and am so pleased to see the final result. I loved reading The Dawn of Technicolor and I had high expectations for Layton and Pierce's new book. Needless to say these expectations were met and then some. This book is gorgeous. It's full of black-and-white photographs, drawings, sketches, music, portraits and color stills from the film. It's smaller in trim size than The Dawn of Technicolor which makes for much more comfortable reading. A lot of love and attention was put in this book and it shows from the self-cover down to the appendix. For anyone who is interested in the early history of film, King of Jazz: Paul Whiteman's Technicolor Revue is a must-have for your library. Even if you have never seen the King of Jazz, the insights into the history of it will teach you a lot about this era in film making. Now maybe one day soon we'll get a Blu-Ray release of the fantastic restoration. This is my fifth review for my Summer Reading Challenge.